Andaru Kerobokan is a three-bedroom luxury villa estate that boasts an eclectic mix of modern interiors with Chinese traditional art and an old Dutch-influenced Indonesian vibe, complete with the heady view of sloping rice terraces in the village of Kerobokan. 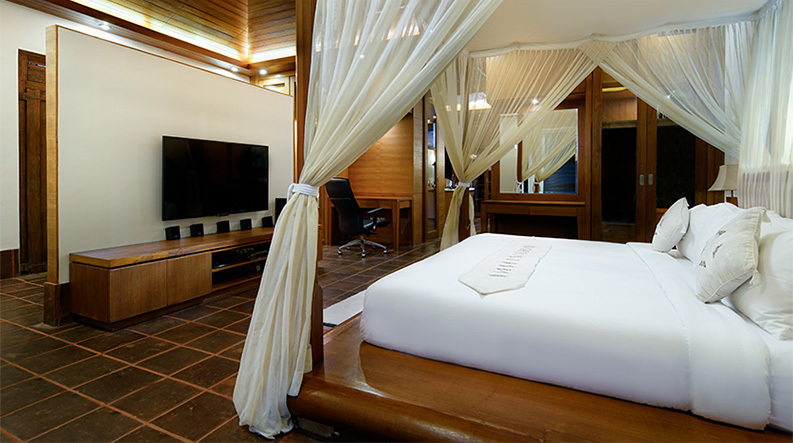 It offers a home away from home, with wireless internet connection and high-class facilities, all built around a peaceful garden space filled with beautiful flowers and plants native to Bali. At Andaru Kerobokan, you can relax and unwind in a villa that delivers everything Bali is meant to be. The bedrooms at Andaru Kerobokan are a haven of tranquility, minimal yet sophisticated in design, large in size and offering the space for you to just – be. Wake up in the morning to the view of a magical sunrise and end the day in serene peacefulness, at one with the simplicity of nature. The main swimming pool is the centre of the villa estate, and so inviting that a dip is simply irresistible, be it an early morning lap at sunrise or a night swim under the stars. Enjoy too the invigorating adjacent hot and cold plunge pools – just the treatment for stimulating the blood circulation. The large open-sided poolside pavilion is just the place to repose, and the pool decks offer comfortable sun beds to soak in the sun as well as umbrellas for welcome shade as needed. 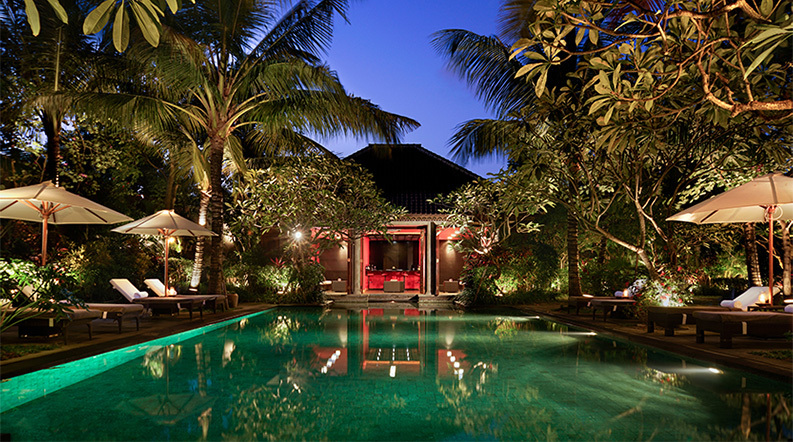 The recessed lighting around the pool in the evening creates a mystical ambience where every care disappears and you are completely in the present moment, at peace with life and at one with nature. 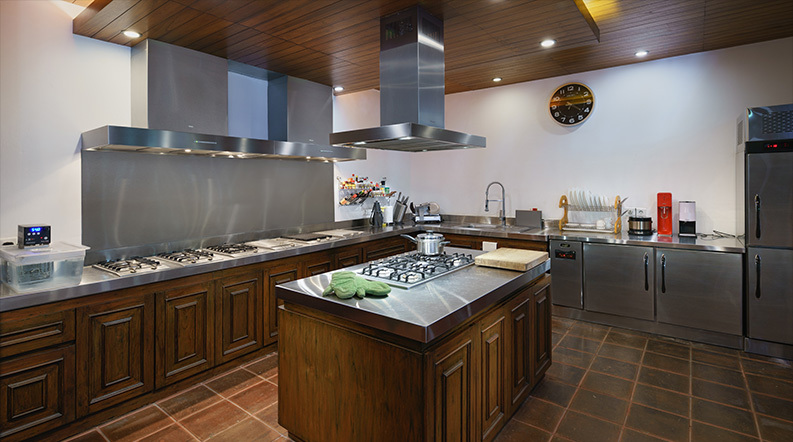 Andaru Kerobokan features a full, professional kitchen adjacent to the living pavilion, yet discretely out of sight. Enjoy an extensive breakfast menu with our compliments, readily prepared for you each morning by our professional private chef and villa staff. Any time you’d like to dine in for lunch or dinner, simply let our staff knows in advance and select from our delicious menu options. 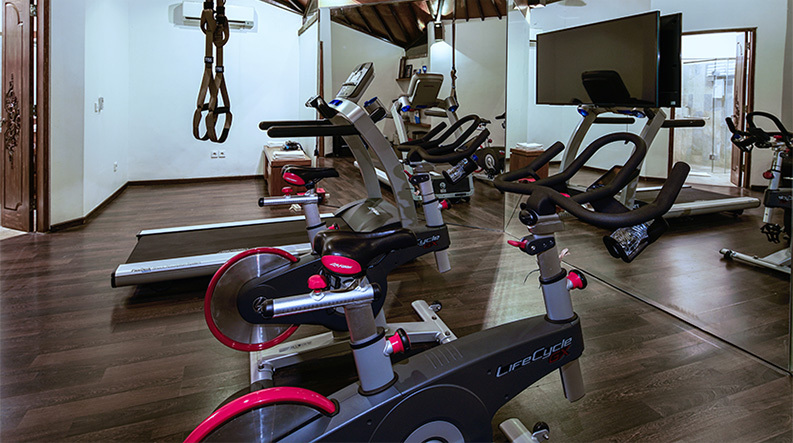 Whether it’s an early morning daily routine or ritual evening stress-release workout, Andaru Kerobokan’s in-house,air-conditioned gym –equipped with state-of-the-art fitness stations, free weights and a mirrored wall – allows for exercise as usual, just with paradise as the backdrop.